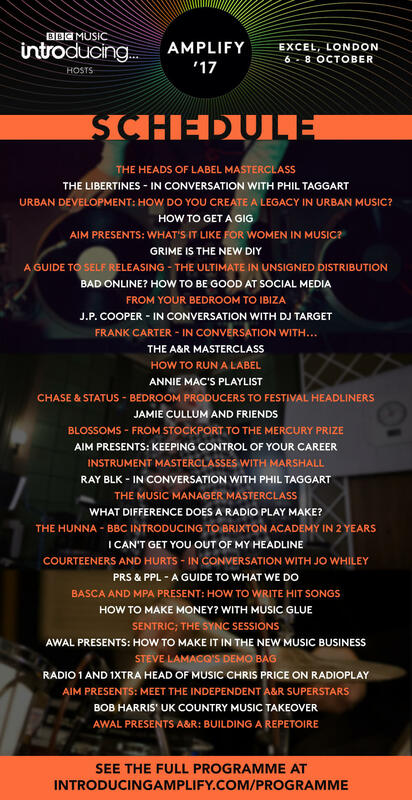 Mark­ing 10 years of BBC Music Intro­du­cing, Amp­li­fy is the biggest new music busi­ness event ever to be held in the UK and a must attend for all musi­cians and any­one look­ing for a career in music. With over 100 ses­sions and 250 speak­ers, Amp­li­fy will fea­ture the biggest names in the busi­ness includ­ing Chase & Status, Melanie C, Marika Hack­man, Nina Nes­bit, JP Cooper and Rae Mor­ris join­ing pre­vi­ously announced The Lib­ertines, Blos­soms, The Cour­teen­ers, Hurts, Frank Carter, Becky Hill, Annie Mac, Jo Whiley, Mis­ta­Jam, Jam­ie Cul­lum, Bob Har­ris and many more. Tick­ets are now avail­able cost­ing £26 for the week­end, with group dis­count tick­ets avail­able for schools, col­leges and uni­ver­sit­ies. Vir­gin trains are also offer­ing dis­counts to tick­et hold­ers trav­el­ling to Lon­don. 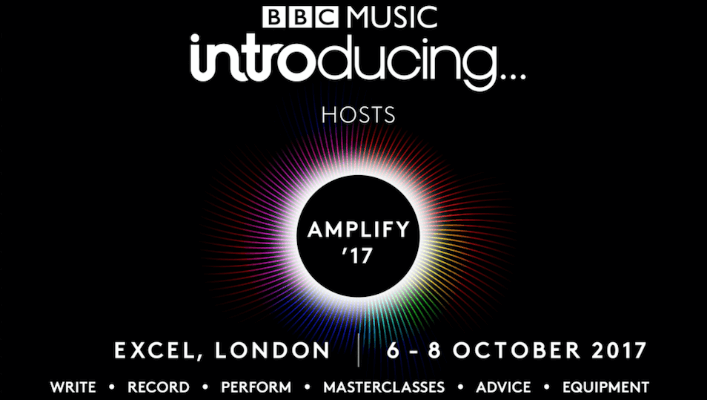 BBC Intro­du­cing Presents Amp­li­fy takes place 6th — 8th Octo­ber 2017, tick­ets and info — introducingamplify.com. With over 100 ses­sions and 250 speak­ers, Amp­li­fy ensures every aspect of the music busi­ness is covered, with high­lights includ­ing Chase & Status — Bed­room Pro­du­cers To Fest­ival Head­liners, Grime Is The New DIY, AIM Presents: What’s It Like For Women In Music, A Guide To Self Releas­ing In Music and much more. Day splits have now been unveiled and avail­able here. Head­line ses­sions from some of the biggest artists around, look­ing back at how they got their big break and giv­ing aspir­ing musi­cians their insider tips. Newly announced to the line-up are: Chase & Status, Melanie C, Katie Melua, Marika Hack­man, Nina Nes­bit, JP Cooper and Rae Mor­ris. They join artists already announced: The Lib­ertines, Blos­soms, The Cour­teen­ers, Hurts, Frank Carter, Becky Hill, Bug­zy Malone, The Hun­na and Ray BLK. Spread across 9 theatres, these dis­cus­sions and hands-on work­shops offer an insight into key ele­ments of the music industry, such as How to Get Your Music on the Radio, How to Get Gigs and Music Manger Mas­ter­classes from artist man­agers includ­ing Tara Richard­son, man­ager Foals, Jamie Oborne, man­ager The 1975, Peter McGaughrin, man­ager Everything Everything. A team of BBC DJ’s will be host­ing ses­sions across the 3 day event, chat­ting to artists and talk­ing about their own music jour­neys. These include Annie Mac, Jo Whiley, Steve Lamacq, Annie Night­in­gale, Huw Steph­ens, Mis­ta­Jam, Jam­ie Cul­lum, Phil Tag­gart, Bob Har­ris, Danny Howard, Tom Robin­son, DJ Tar­get, Twin B, Monki, Abbie Mcarthy, Sophie Little, Geor­gie Rogers and Yasser. A chance for you to hand your demo over to BBC Intro­du­cing DJ’s Steve Lamacq and Huw Steph­ens who will listen and cri­tique your demo there and then! Amp­li­fy hosts some of the lead­ing experts from the UK’s biggest music gen­re right now – includ­ing Alex Boateng — Island Records, Amber Dav­ies – Warner Chap­pell, Alex Griffin – GRM Daily. Agents and pro­moters dis­cuss how to get on a line-up – includ­ing Steve Tilly – Kili­man­jaro Live, MattBates – Primary Tal­ent Agent, Jon Mcid­ow­ie – Read­ing & Leeds, Beck­ie Sug­den – X-Ray Tour­ing. Meet with a host of BBC Music Intro­du­cing DJ’s, pro­du­cers and industry staff, with tips and advice on how to make your break as well as the chance to have your demo listened to. The Band­stands in asso­ci­ation with Sentric Music: Con­tinu­ing their tra­di­tion in show­cas­ing unsigned tal­ent, Intro­du­cing Band­stands will fea­ture the next gen­er­a­tion of new tal­ent as well as offer­ing ‘open mic’ ses­sions, too. Vinyl Mar­ket­place: Hos­ted by ERA, the team behind Record Store Day, Vinyl Mar­ket­place has stalls from record shops the coun­try.